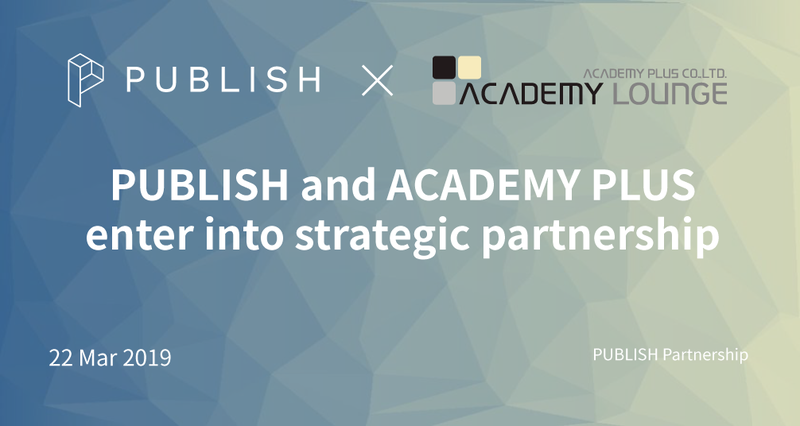 On March 22, PUBLISH entered into a strategic partnership with ACADEMY PLUS, a comprehensive education solution provider. This business agreement is more meaningful as the first agreement with providers of education solutions in the PUBLISHalliance agreement. ACADEMY PLUS is now expanding into a smart campus that includes educational programs beyond the space rental business. To expand the education platform, we are trying to combine key new technologies such as AR, VR, artificial intelligence and block chain to reflect the latest trends in education and the latest digital technology. ACADEMY PLUS will conclude business agreements with PUBLISH, and will create a new paradigm in the educational field that introduced block-chain technology. In addition, they will build a leading system that will utilize the blockchain media solution, PUBLISHsoft, to record reputation records of the authors and appropriate compensation and task management. In particular, because it is a system that introduces block chains, ACADEMY PLUS expects to improve the security of processing such as variety of data in education, ranging from personal learning and record grades in educational institutions, various curricula for teachers, undergraduate, master’s and doctoral degrees. The Academy Lounge, run by Academy Plus, aims to make the reading room a space to help examines succeed in their entrance examinations, rather than just a space rental business, after the official report on the affiliate business was submitted to the Fair Trade Commission in May 2015. And 57 branches. Academy Plus is a company that has led Korea’s unique reading room culture as a franchise business under the mission of “helping many people to live a successful life and becoming an origin that will change the world further.” In recent years, they have expanded into smart campuses including educational programs and are promoting a transformation into a core platform for the lifelong education era. Through this, they plan to expand into a next-generation education platform that integrates and manages all management, from learning to employment. PUBLISH, Inc. is a software service provider for digital newspaper newsrooms. Its mission is to restore financial viability among independent publishers through tokenization. Its initiatives include PUBLISHprotocol, an open source blockchain media protocol; PUBLISHalliance, a consortium of media enterprises, technology providers, and academic institutions tasked with the development and proliferation of PUBLISHprotocol; and PUBLISHsoft, a proprietary end-to-end publishing system enabling publishers to issue their own PUBLISHprotocol-based cryptographic token.